This is one of the most highly requested blog posts: How to increase Instagram engagement organically? The Instagram algorithm seems to really, really like engagement. Even more than the number of followers you have. I’m going to show you how you can satisfy the Instagram algorithm to increase your Instagram engagement, and grow your account. 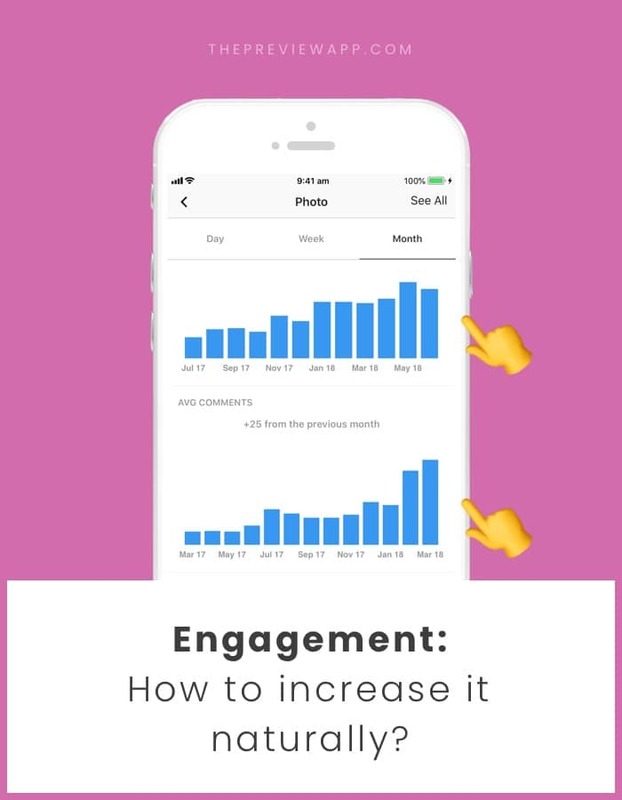 If you have good engagement, Instagram will try to show your posts to more people. They might show your posts on their Explore page and Top 9 posts of their Hashtag and Location pages. Even better, they might select your posts to be shown in people’s home feeds (thanks to the new Follow Hashtag feature). Remember: Instagram doesn’t allow anyone to use automated tools like robots that automatically post, comment, like or follow on your behalf. So forget about that. It’s against their Policy and can get your account in trouble (sometimes without you even knowing it). So let’s bring it down the basics. How can you increase your Instagram engagement organically? I’m going to share with you 22 of my favorite strategies, tips and tricks that you can use to increase your Instagram engagement. I don’t care how many Instagram tips you read. If you don’t have quality content, nothing will work. Nobody will stop to scrolling to watch your photo or video if it doesn’t look good or catches their attention. It’s the first step of what I call the “Engagement Loop”. A hashtag is the first step. It will bring people to your post. Then it’s your turn to make sure your post is engaging (I’ll give you some tricks below). You should use the right hashtags and avoid using random ones. Use all 30 hashtags (that’s the limit Instagram gives). The more hashtags you use the more you increase your chances to be seen by more people. Your Top Posts are the ones that get you the most engagement and growth. You can see your Top Posts in Preview app. Analyze your best performing posts (photos, videos, carousels). What colors are the photo? What did you write in the caption? Your Top Posts are what people love to see the most. So post more photos, videos or carousels like your Top Posts to keep growing your account. Ok let’s slow down for a second. Not all your posts need to be about getting the best Instagram engagement of your life. Relax. You can post in patterns. Here is an example of a pattern: Post a photo that you know will get you a lot of engagement, then post a photo that might not get as much engagement (and that’s ok! ), and so on. If there is only ONE tip you need to remember, it’s this one: Post consistently. How to post consistently? Plan your posts in advance. Again, you can use Preview app to schedule your posts. You can plan your posts a few days in advance, or a week in advance, or a whole month if you want to. Consistency is key on Instagram. Now that people are on your post, what can you do? One strategy is to ask a question in your caption. What people feel about a certain topic: “What do you think about the new Instagram algorithm? You don’t have to ask questions ALL the time. Keep it natural. People go out of their way to comment on your posts. Always reply to the comments or try to reply to as many comments as possible. If you’re starting on Instagram, don’t rush (even if it’s very tempting). Take your time. Find a small group of people who have the same interests as you. Support each other whenever one person is posting (turn on your post notification to know when they post). Then continue to increase your circle of friends on Instagram (use hashtags to meet new people). Have a look at the accounts who are following you. It is not humanly possible to always check who is following you. But from time to time, have a look at who follows you during the day. They follow you because they like you’re sharing – you might like what they’re sharing too. If you really like what they’re doing, leave a little comment or send a DM. Tell them you’re happy you found their account (for example). Start the conversation. You just made a new friend (isn’t Instagram amazing?!). Fun photos, quotes or quizzes get people’s attention and reaction. That’s another fun post idea to increase your engagement. It’s a very fun way to get people together. And in the process you also get to know them a bit more. Be yourself. What’s on your mind? What do you love to do or talk about? Some people are amazing at captivating our attention with their words. You too can start genuine conversations with people. Great examples are Tyler McCall and Michelle Blanchard. They both are real and passionate. Their followers are always happy to have a good chat with them. This will create a snowball effect. New people might comment on your post. And they might also discover your account for the first time. This is probably one of my favorite ways to get everyone to have fun, for 2 reasons: (1) It gets everyone involved, and (2) everyone gets to meet new people. I might do that soon on our account (@preview.app) if you want to join the fun! Post what you love. Be passionate about what you post. Do it for yourself. People naturally react to passion and will want to follow your journey. Don’t stress and be yourself. This is one of the most popular ways to increase engagement. It might spike your engagement temporarily, but you might meet new people in the process. You can do a giveaway by yourself or in collaboration with other Instagrammers. For example, @thebuckletlistfamily loves to play Trivia Games. They will ask a question to their followers. The first one who guesses the right answers gets a gift. That is such a fun idea! Sue Zimmerman did it for one of her posts and people loved it! Ask people to take a screenshot of a video (wh-wh-what!?!). I call these types of posts “Wheel of Fortune” posts. I can’t believe I have to write this, but I have to because engagement = being social. Instagram is a SOCIAL network. You gotta be social. Just like in real life, if you never talk to people, nobody will talk to you. So stay calm and have fun, don’t overthink it too much. Keep in touch with your followers and those you’re following. That’s how the Instagram algorithm works. You will show up more in people’s home feeds if you interact with them. Interaction = good sign = increase exposure = increase your chances to get more engagement. A lot of people do this and there’s a good reason for it. Here’s the reason: it’s good to increase your engagement as soon as you post on Instagram (within the first hour you posted your photo) because it signals to Instagram that your content is good. And if it is good, Instagram will try to show it to even more people. Your followers are watching your Insta Stories. So let them know when you have a new post. Give them a sneak peek. For those who don’t know, #fridayintroductions is a hashtag community where every Friday, people introduce each other. They usually share a post about what they do, what they’re passionate about, and even some fun facts about themselves. Then, they invite people to introduce themselves too in the comments. It’s like a big Instagram party at the end of the week. That’s it! If you’ve read until the end you’re a champion (????). I really hope you found some of these tips useful for your account. Now it’s your turn to add your own creative twist to these ideas. Have fun! If you have any questions please leave me a comment below.